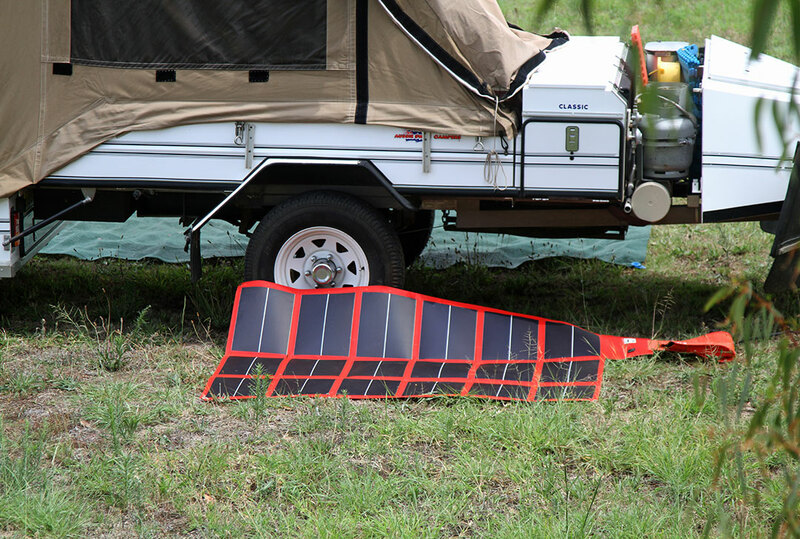 In the past decade, there has been an explosion of solar panels for caravans and camping. Previously, a gathering of campers or vans saw just a handful of panels; now, they are seemingly everywhere. Solar panels were, until several years ago, essentially rigidly-framed glass sheets. They were heavy and awkward, and required care in handling. Then came the development of solar blankets. These have solar cells attached to a flexible cloth backing, so they can be rolled or folded up and packed away. Generally, they are more forgiving – some can safely deal with being stepped on and we even heard of one that was blown off the back of a camper, slid along the highway, was run over by a truck, and survived! Solar blankets are lighter, watt for watt, than their rigid cousins and are much smaller packages when folded up. There are, however, several downsides. Solar blankets are generally more expensive, though prices are starting to fall. Maximum outputs are more restricted than in the rigid panels and, as they are big and floppy, they can be a little less convenient to handle and it can be harder to find a place in the sun for them. 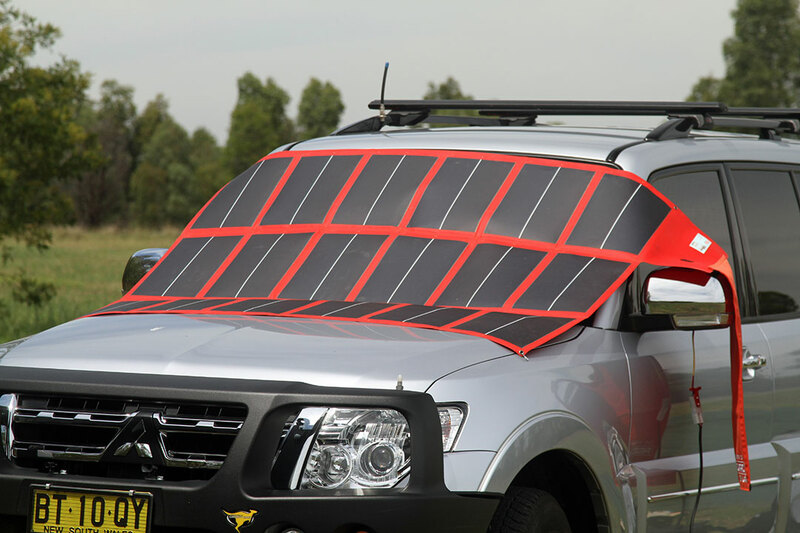 Some of these amorphous panels, though, do not require much, if any, adjustment and one of the good things about blankets is that you can place them across the windscreen of your vehicle so they keep the car cool while collecting amps! Solar panels are generally rated by wattage. However, these are idealised figures that are rarely achieved in practical application. Your regulator is a significant factor in efficiency. A solar panel produces much higher voltage than your 12V battery system can use (16-21V), so we must use a regulator. Older regulators worked at around 70 per cent efficiency, so a 100W panel might only supply 70W of power to the battery. More modern maximum power point tracker (MPPT) regulators are up to 30 per cent more efficient, giving you up to 90 per cent of output. Solar panels come in four basic forms: monocrystalline, multicrystalline, polycrystalline and amorphous. The first three are usually glass-fronted panels with the crystalline cells behind. The latter is a duller, vinyl-like material. Each has its advantages and disadvantages. The first three are smaller in size per watt of output and are usually cheaper. However, they are less efficient under cloud and are seriously impaired by shade or shadows. And, as these panels are protected by glass, they must not be stepped on or damaged – a constant risk if laid on the ground. Amorphous panels, while being bigger, are more tolerant of high temperature and cloud, and are much less impacted by shade. Being of a duller, less reflective finish, they absorb light energy more efficiently, so are more tolerant of less ideal orientation and will produce more power earlier and later in the day. The full feature appeared in Caravan World #534, February 2015. Subscribe today for the latest caravan reviews and news every month!